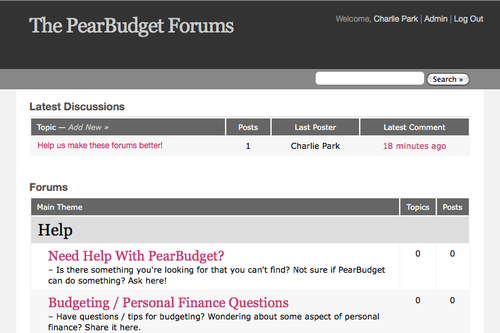 I’m really excited to announce that we have brand-new PearBudget forums! The address is pretty easy to remember: http://pearbudgetforums.com. I know they’ll be a little slow at first, but I’d really love for you to go, create an account, and post a message. Have a question about budgeting? There’s a board for it! Find a bug in the software? There’s a board for it! If message boards aren’t your thing, no worries. We still LOVE getting e-mails from you, and, in fact, prefer getting direct e-mails for anything sensitive about your PearBudget account or your subscription. But if you have a general question, please try posting it to the boards! None of us is as smart as all of us! The boards are still in a bit of a transitional state at the moment, so if you have any issues with them … well … there’s a board for that, too! Post a comment, and let us know what’s up! I’ll see you on the forums!